Seated in front row from left: Toshao of St. Cuthbert’s Mission and NTC Vice-Chairman, Mr. Lennox Shuman, Minister of Indigenous People’s Affairs, Mr. Sydney Allicock, President David Granger, Minister of State, Mr. Joseph Harmon and Chairman of the National Toshaos Council (NTC), Mr. Joel Fredericks. Standing at the back from left: Manager of the Land Administration Department at the Lands and Surveys Commission, Mr. Marcel Hudson, Toshao of Shulinab Village, Mr. Nicholas Fredericks, Executive Director of the Amerindian People’s Association (APA), Ms. Jean La Rose, Mr. Peter Persaud from the Amerindian Action Movement of Guyana, Coordinator of the National Amerindian Development Foundation, Ms. Zelita Debedin, President of the National Amerindian Development Foundation, Mr. Ashton Simon, Mr. Colin Klautky from the Guyana Organisation of Indigenous Peoples (GOIP), and Toshao of Chenapau, Mr. Edward McGarrel. Chairman of the National Toshaos Council (NTC), Lenox Shuman Friday night said he was pleased with the outcome of talks with President David Granger about the controversial Lands Commission of Inquiry, but the Amerindian leader declined to say whether the Council has changed its original position. “I am not in a position to answer that question unfortunately,” Shuman said. The NTC had at first demanded that Amerindian land issues be separated from those of ancestral African lands. The NTC Chairman said that statutory body and the President would have to further discuss whether there should be a separate commission. “We have started down a very, very progressive path most of the issues that we would have had with the commission,” said Shuman. Declining to go into details about the talks the NTC held with the President on Thursday, the Council Chairman hailed the talks as “constructive.” “The dialogue was very, very constructive and it has given us great reason to be optimistic that we can all chart a path forward that is not only good for Indigenous Peoples but for Guyana,” Shuman told Demerara Waves Online News. Asked whether the Lands Commission of Inquiry would continue its work, Shuman alluded to the public commitment given by the President following discussions with the Amerindian People’s Association (APA) to suspend land-titling. Shuman said Granger presented a five-point plan to resolve the issues, and the NTC was looking forward to further dialogue. The Ministry of the Presidency said that plan includes: a review of all existing agreements and conventions relating to Amerindian lands, a review of the Terms of Reference of the Commission, endorsement of the principal of Free Prior and Informed Consent (FPIC), reconciliation of the positions of the NTC and the Government on the objectives of the Commission of Inquiry and a review of the Amerindian Act. The People’s Progressive Party (PPP) had issued calls and condemnations about the Lands Commission of Inquiry similar to those by the NTC. Among the concerns was the alleged failure by the President to first consult with the NTC before establishing the Commission of Inquiry. 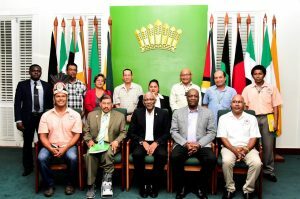 The Ministry of the Presidency said Granger explained to the delegation that contrary to the impression that is being created, the Administration never intended to set up a Commission to deal with Indigenous lands and not involve Indigenous peoples. In fact, that Commission’s mandate was to engage with communities in order to examine and make recommendations to resolve issues and uncertainties surrounding the individual, joint or communal ownership of lands and Amerindian land titling issues. He also spoke of the five-point plan that he proposed to the APA last Wednesday.